Jelly Fish are so fascinating! 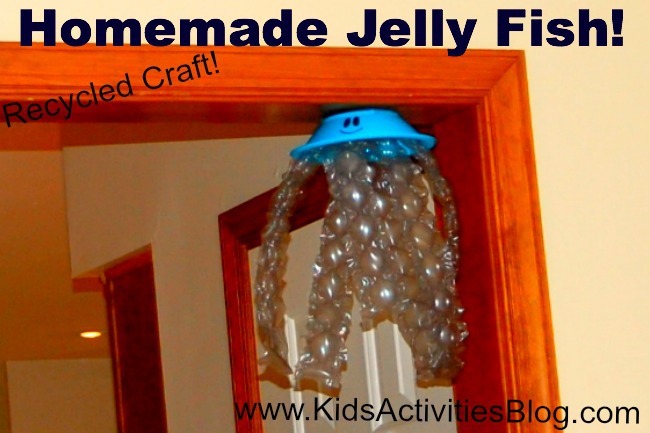 Now your kiddos can make their own jelly fish with this cute recycled craft project. We love recycled craft projects at Kids Activities Blog! Rory loves sea creatures. We live by the beach and she loves to go and see what creatures the waves can bring ashore. We have seem shells, fish, crabs, and our most recent discovery, was a jelly fish. Since Jelly fish are very similar to Rory's favorite sea creature, the octopus, she has become quite curious about what they are and what their legs  do. This week we decided to make our own Jelly fish. These are so easy to make! We lucked out with having some left over plastic bowls around the house from when Rory had some friends over. We always have bubble wrap around because Rory's aunts always send her presents. To make these, take the bubble wrap and cut it into long strips. Keep the main bubbles intact, its fine to cut the bubbles around it. Take the plastic bowl and sit it upright like you are going to put some cereal inside. Place the long strips of bubble wrap or the tentacles  inside the bowl and tape them. Depending on how long you want your tentacles, you can either tape them to the sides of the bowl or the middle of the bowl. Once all your tentacles are in place you can now decorate! Rory enjoyed coloring them with markers and putting stickers on them. We also drew smily faces on them. We now have Jelly fish all over in our house.